EASITEX is a brand new and patented tension fabric system - its innovative technology has given it the reputation of the ‘next evolution’ in textile signage. Why? Well, there is no need for a silicon strip to be sewn or attached to your prints! This leads to a number of benefits and reasons why you should choose EASITEX over other soft signage solutions out there. We take a look at why EASITEX should be your number one choice! EASITEX is textile signage… REINVENTED. It’s seamless in nature and streamlines the whole sign-making process, making the creation and assembly of your sign simple. EASITEX’s patented technology means there’s no need for a silicon strip to be sewn or attached to your prints. This change means EASITEX is more cost effective and a more environmentally friendly option compared to traditional Tension Fabric Systems. EASITEX has an internal “grip strip” which clamps the fabric into a firm position leaving you with a great and hassle-free finish. Simply print slightly larger than your frame and you are good to go! If you couple that with our specially designed and bespoke Tension Tool, installation is comfortable, quick and easy. EASITEX is easy to assemble and comes with drill-less corner arrangements across the range. The corner assembly comprises of easy-to-use corner keys that will slot into each profile and secure in place by tightening the pre-packaged screws. MONEY SAVING - EASITEX is a more cost-effective solution – You could save as much as 40% per print! FASTER - Prints can be supplied with a quicker turnaround – with less manufacturing needed, often delivery terms are improved significantly. RELIABLE – Sewing silicon strips to textile prints is a difficult task and virtually impossible to perfect, EASITEX gets rid of the hassle. Not only that, you can have peace of mind when delivering prints to site! MORE ENVIRONMENTALLY FRIENDLY – With less plastic, rubber and materials needed, EASITEX is greener than other Tension Fabric Systems. With one reusable Grip Strip, one plastic element can take dozens of prints over the lifespan of your sign. DIVERSIFY – If you are unable to sew a silicon strip but can produce textile prints, then EASITEX allows you add to your product portfolio without additional investment! 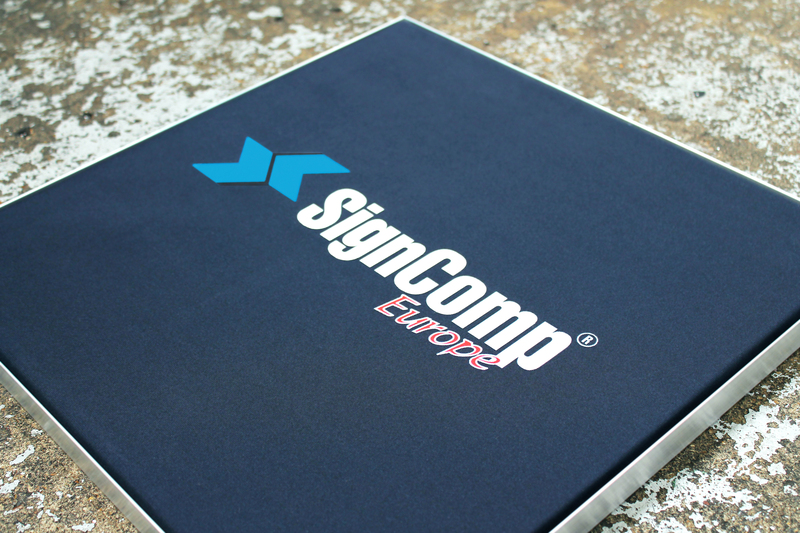 At SignComp we provide a selection of EASITEX profiles. This includes 4 different depths of 25mm, 50mm and 80mm single-sided profiles and a 100mm double-sided profile. SignComp Europe will be looking to add to our range to offer a more extensive portfolio, however these sizes will meet the majority of signage requirements. EASITEX can also be provided with our bespoke tensioning tool designed with comfort, efficiency and ease of installation in mind. EASITEX is a brand new patented product that would be a great opportunity for your business to grow and adapt. Should you have any questions or queries regarding EASITEX, simply email or call our team today for more information at sales@signcompeurope.com or 01403 272704 where we will be happy to assist you.